The annual surge of new retirement applications that come at the start of a calendar year has pushed the backlog of retirement claims to a level not seen since around this time last year at the Office of Personnel Management. 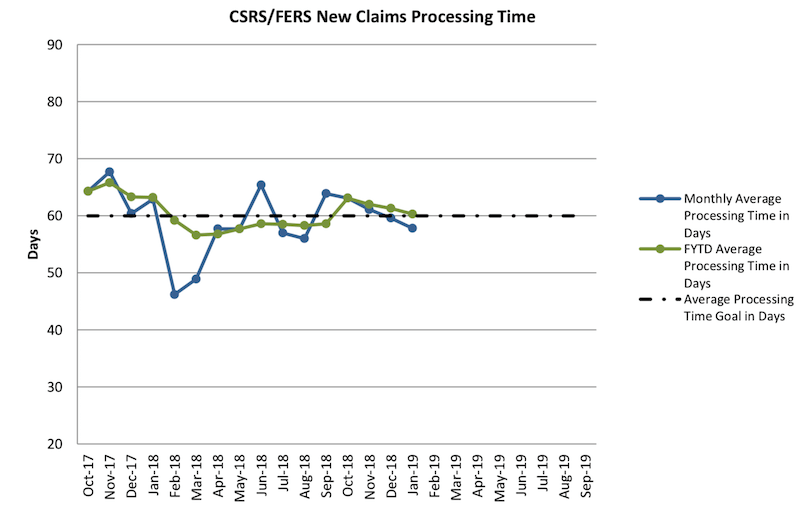 OPM received 13,264 new claims in January which is actually 9% less than January 2018. Even though OPM processed 8,162 claims last month (almost 18% more than it did in December), the influx of new applications pushed the backlog up to 23,121, 28% higher than where it stood at the end of December. However, high as the new backlog is, it still has not reached the level of February 2018 when it was 24,225. It will be interesting to see if February has as many new retirement applications as it did in 2018. Last year, over 13,000 new retirement applications came in February on top of the over 14,000 in January which gave the backlog a big boost. If this report is any indication, it suggests that the shutdown that started just before Christmas did not increase the number of retirement applications to kick off the year (not so far anyway). The latest complete retirement backlog statistics from OPM are included below.